Yesterday, Zeffert and Gold catered a cocktail party for Exelon Energy. It took place at Penguin Coast in the Maryland Zoo. This incredible exhibit it home to African penguins, an endangered species. The Maryland Zoo The new penguin habitat provides guests with an up close and personal experience with these beautiful creatures. Penguin Coast has a dump tank to help keep the water clean, but it also adds to the ambiance of a cocktail party with the sight and sound of the water splashing. 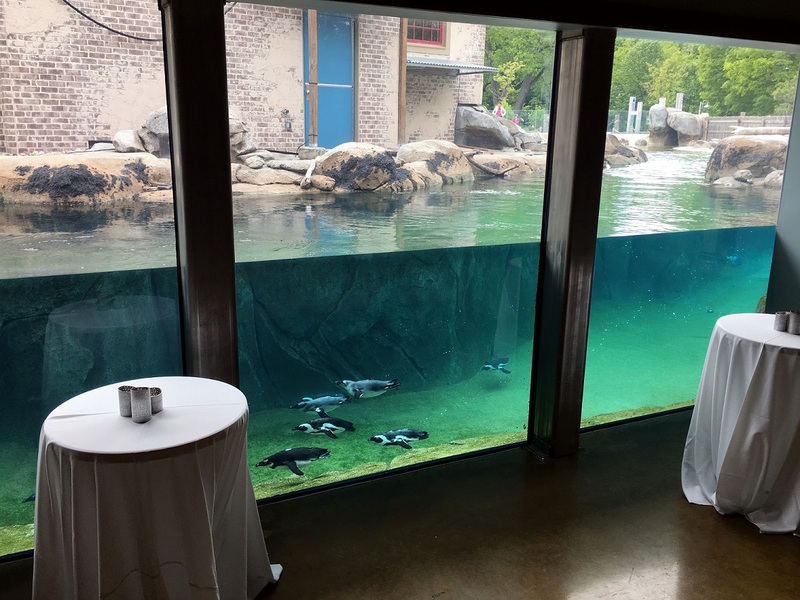 The clear glass tank allows you to actually watch the penguins swimming and playing. In addition, an actual penguin ambassador who joins you for part of your party. Of course, he is accompanied by a penguin keeper. They take time to inform the party about the exhibit and African penguins. Such an exciting experience! The cocktail party had a Chef Attended Slider Station. Zeffert and Gold prepared several types of sliders such as Brie and Balsamic Strawberry, Spicy Chicken BLT, and Sirloin Beef with frizzled onions. Party goers were able to explore the Penguin Coast while enjoying their food and drink. The weather was perfect, and the guests took full advantage of all aspects of the state-of the-art exhibit. Not to mention, food items were offered on ecofriendly palm plates and cutlery. The bartenders poured drinks into biodegradable cups. Zeffert and Gold is committed to sustainability, executing minimal waste events. The Penguin Coast is such a unique and amazing venue for private events. We love helping to create amazing, memorable events together with the Maryland Zoo! Error: Error validating access token: Session has expired on Friday, 12-Apr-19 20:42:14 PDT. The current time is Thursday, 18-Apr-19 05:15:15 PDT.